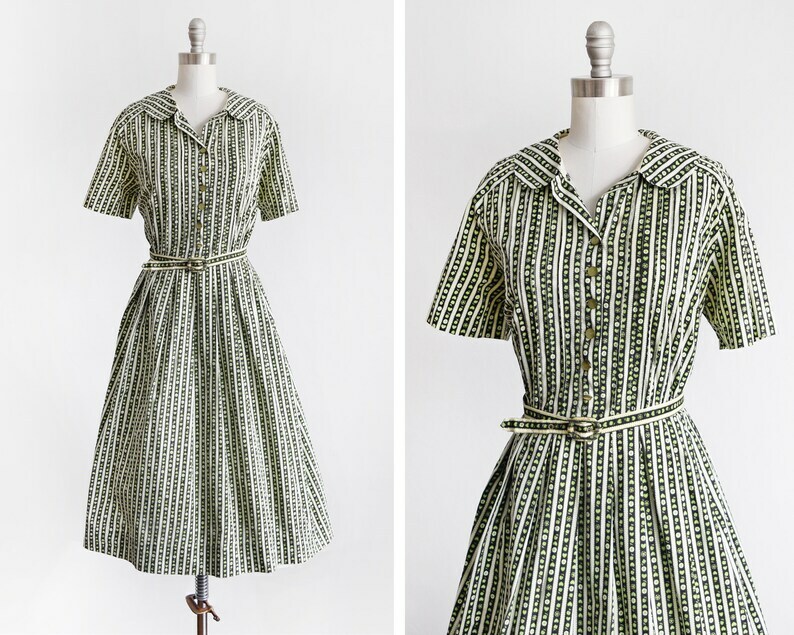 Adorable vintage 50s novelty print dress. Black and white vertical striped, with green and white apple, stars, an heart folk print. Short sleeved with green buttons down the front. Small metal snap buttons on the left side. Matching belt with cinched waist and flared skirt. This dress is super cute, but it does have some issues. There is some yellowing under the arms, on the back, and along the color. The front buttons have some scuffs, and the last one doesn't match the rest. There's also some miscellaneous mends on the back left side, the belt loops are no longer fully detached, a small bleached spot on the front of the skirt, and the belt has some staining. That being said, the dress is still has a lot of life left to it, and some of these flaws are only noticeable up close. The price reflects these flaws. Dress is shown with a crinoline slip which is not included. Shoulders: no seam, but around 17"
Condition: Good vintage condition (see description for any flaws). This garment has been cleaned and is ready to wear.